This painting by Adelaide Hiebel titled, "In A Forest Glade", was created by Adelaide Hiebel in 1941for the Gerlach Barklow Calendar Company. Often, the Indian maiden was pictured with an animal, such as in this painting. 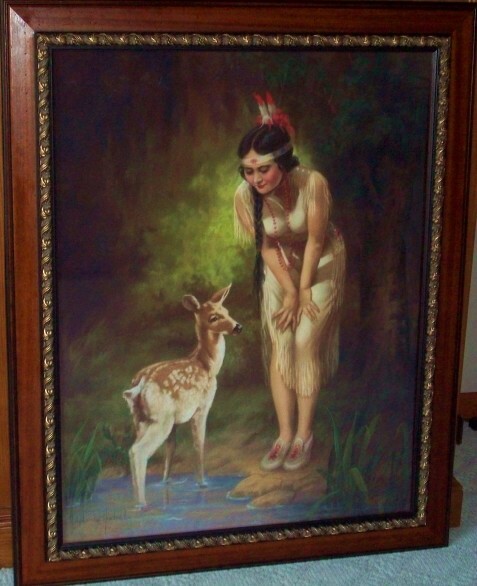 This Indian maiden appears to have a close bond to the animals of the forest. It was common for artists to paint beautiful young Caucasian girls dressed as Native Americans, wearing a Native American headband, beads, and a costume. The American public adored these Indian maiden girls until the 1940's World War II era pin-up girls surpassed them in popularity. Adelaide Hiebel was born in New Hope, Wisconsin in 1886. Her father was a prominent tailor in Waterloo, and she became an expert seamstress. By age 11, she had been given a box of pastels, and had fallen in love with this medium. She attended the Art Institute in Chicago. Hiebel opened a studio in Waterloo, Wisconsin. There, she met Zula Kenyon, an already successful illustration artist with the Gerlach Barklow Calendar Company in Joliet, Illinois. Kenyon became Hiebel's mentor. Kenyon's health was forcing her to retire and move to the west coast. She recommended to Theodore Gerlach that her good friend, Adelaide Hiebel become her replacement. Hiebel's early work is much like that of Kenyon's artwork. In order to retain the customers that had grown accustomed to Kenyon's work, they wanted Hiebel's early work to resemble that of Kenyon. The majority of images were very large at 30 x 40 inches and were done in pastels. Hiebel worked with live models, as well as from photographs. Hiebel eventually moved her studio to her home in Joliet. Her artistic range was excellent, rendering paintings of landscapes, children, and beautiful women. Hiebel's Indian maiden subjects are highly collectible and thought by many to be her best works. Indian maiden subjects were very popular with other illustration artists as well, and vintage calendars with this subject matter by any known illustration artists are desirable. Unlike many of her peers, Adelaide Hiebel purchased many of her paintings from the calendar company after they were no longer being used by the company. It is not known what happened to the paintings she owned after her death. Upon her retirement, Hiebel moved to California. Adelaide Hiebel passed away in 1965 in Santa Anna, California.